A word of warning to filmmakers: If you’re going to satirize something that already teeters on the brink of self-parody, you’d better have something unique to say. 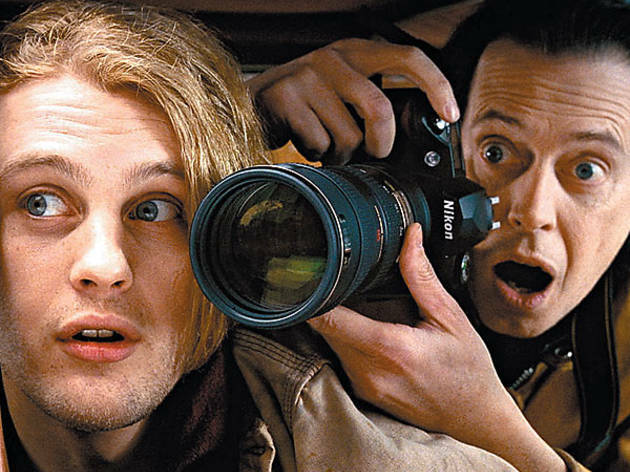 That’s the big mistake of Tom DiCillo’s stillborn comedy about the seedier side of showbiz, which does little besides gently jab at its subject and repeat self-evident truths. Apparently, celebutantes are vapid and the paparazzi are parasites. Wow, who knew? 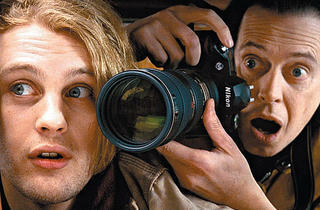 Stumbling across a slew of photographers staking out a restaurant, homeless would-be actor Toby (Pitt) attaches himself to the sleaziest of the shutterbugs, Les (Buscemi). The kid soon becomes his assistant, helping the tabloid veteran nab pics of stars postsurgery. Along comes K’harma (Lohman), a starlet-singer-model (but what she really wants to do is have her own fragrance) who takes a liking to the cherubic lad. Toby becomes megafamous. Les feels betrayed. Viewers glance at their watches. It isn’t like DiCillo is incapable of doing send-ups or buddy flicks—witness Living in Oblivion (1995) or the underrated Box of Moonlight (1996). But he’s off his game here: The caricatures of Hollywood sycophants and media scumbags are obvious and painfully unfunny, while the life lessons about friendship feel as if they’ve been lifted from a Hallmark card. Delirious? Not quite. Delusional? Most definitely.